The large cenotaph sarcophagus of Emir Sultan (1349 or 1366-1429) in the center of the room is covered with velvet, embroidered in gold thread, and is surrounded by a grid, very much like the royal sarcophagi of Osman I, Orhan and Murat I, whose restorations date from the same period. Such honour can be explained by Sultan Emir’s descent from the Prophet (Mohamed), which turned his resting place into an important pilgrimage site in Turkey. 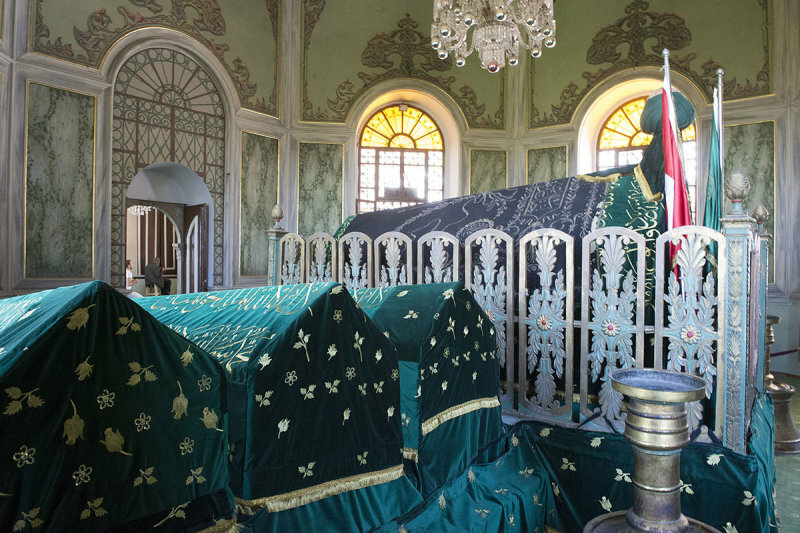 Four smaller sarcophagi surround the large catafalque: those of his wife Hundi Fatma Hatun (a daughter of sultan Yıldırım Beyazıt), his son Emir Ali Çelebi and two of his daughters. ‘Bursa - Turquie’ – booklet of the Bursa Müzeleri, 1980 & Website of ‘lifeinbursa.com’.